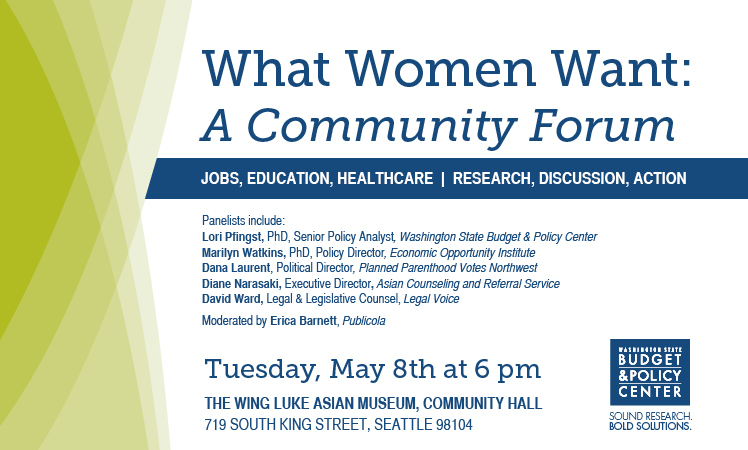 Please join EOI, the Washington State Budget & Policy Center, and other community partners for a forum titled What Women Want: Jobs, Education, & Healthcare. This free community forum on Tuesday May 8th from 6 to 8pm, will highlight the impacts of the recession and state budget cuts on women in Washington. It will focus on how the unprecedented cuts to our state budget are disproportionally harming women’s employment, economic security, health, and safety. Marilyn Watkins, EOI Policy Director will join other panelists in discussing policies that should be pursued at the state level as our economy recovers, and how we can ensure the recovery is equitable for women. Attendees will be invited to join the discussion during the Q&A session. Click here to RSVP for the forum (it’s a free event, but space is limited).